While establishing a campsite for his family and friends prior to the Lanai Keiki Fishing Tournament at Hulopo'e Bay, Chase Urpanil set up an ulua pole that his girlfriend Dajia had given him for Christmas. He slid a live 2-lb o'io hooked on a 15/0 Mustad for bait. 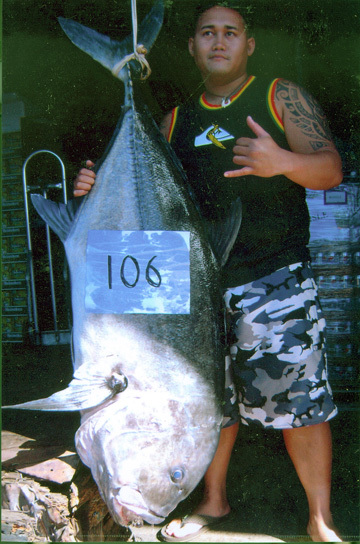 A short time later, a 106-lb 5-oz monster ulua was putting the Wasabi ulua pole and Chase's C550 Newell reel to the test. After a 20-minute fight, Keoni Hanog gaffed the beast and ended the epic battle.